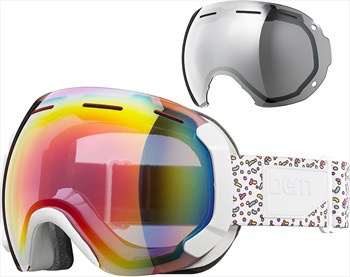 The Monroe is Bern's large frame women's premium goggle featuring PLUSfoam. 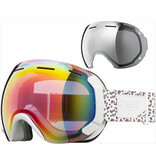 The patented Monroe is the industry's first soft foam goggle frame (Patent #D776,187). This recyclable goggle frame offers a super comfortable soft fit that conformers perfectly to your face, is extremely lightweight and breathable, and has virtually zero manufacturing waste and did we mention it's 100% recyclable? Designed with a spherical lens for superior peripheral vision, less glare and less distortion, great insulation and air flow for minimal to no fogging so you can spend the day lapping your local mountain with the vision on what lies ahead. Lens POP allows for a quick and easy change of your lenses to adapt to any lighting condition. The Monroe also includes one spare lens packaged specifically to the frame to give you more visual versatility on any given day.